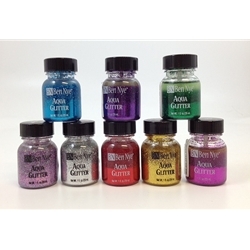 Sparkling non-metallic Glitter Paints produce stunning effects, unmatched for brilliance and durablity. Apply directly on skin or over dry liquid paints, cake makeup or powdered creme makeup. Dries to a flake finish. Easy cleanup with cleanser and water.